Ever notice the magnetic draw that a puddle of water has on a child? It’s as if they have absolutely no bodily control over their little legs when they’re in any proximity to a puddle; like they’ve been possessed by an extraterrestrial pull that compels them to test the waters. Covered in green sludge? Sweet Jesus, like hitting the motherload. There is no hesitation. 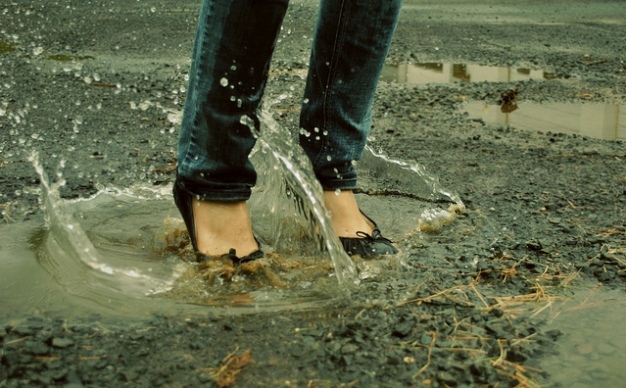 There is no time to think about the new shoes they are wearing, or the mud that will splash on their pristine dress clothes. There is no self-restraint, nor a moment of regret in the aftermath. Why can’t that be me? When did I lose that inhibition, that spirit of freedom, that reckless abandon? You know what today is? It’s “Taking Back Tuesday,” so I’m tacking back my childhood self. I’m going full speed, two-footed, and regret free. Cause it’s “Taking Back Tuesday,” and that’s how I roll. This entry was posted in Molly-isms. Bookmark the permalink.